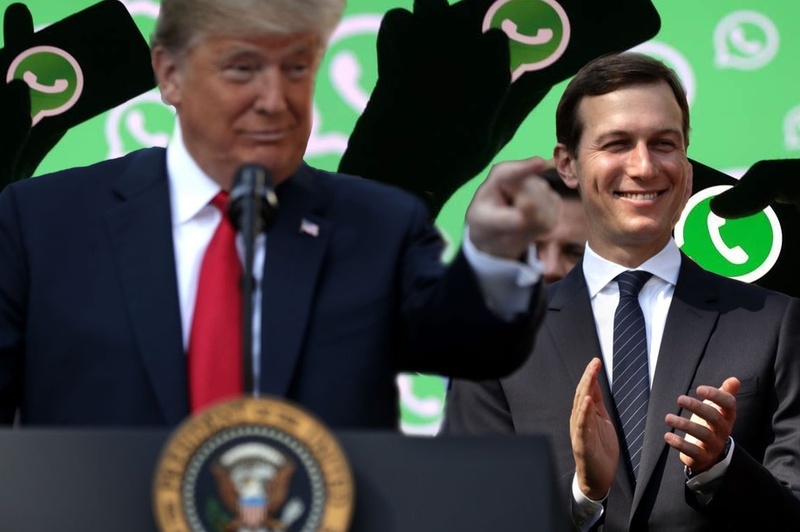 House Oversight Chairman Elijah Cummings says Abbe Lowell has confirmed that President Donald Trump's son-in-law and White House advisor Jared Kushner has been using the encryptable/disappear-able messaging WhatsApp to communicate with leaders of foreign nations. "Mr. Lowell could not answer whether Mr. Kushner's communications included classified information." Mr. Kushner's attorney disputes the claims in the Cummings letter. Kushner's the tip of the iceberg -- the House attention to this is about a number of additional White House senior staff communicating in the same manner. If true, we are talking about many people committing violations of federal record-keeping laws. If they're doing so to hide their involvement in other possibly criminal shenanigans, we are talking even more serious business. In a Thursday letter to the White House, the Maryland Democrat alleged that Jared Kushner, who is also a senior White House adviser, had been using WhatsApp, a popular messaging application, to "communicate with foreign leaders" -- something he said that Kushner's attorney had confirmed in a private meeting. He also contended that Trump's daughter Ivanka Trump, also a senior adviser, may be in violation of the Presidential Records Act by her use of private emails. The allegations from Democrats that some of Trump's closest confidants -- as well as former officials Steve Bannon and K.T. McFarland -- used personal email come as Trump continues to attack Hillary Clinton for using a private email system when serving as secretary of state. In the letter, Cummings revealed that his panel learned the new information in a private meeting in December with Abbe Lowell, an attorney for both Kushner and Ivanka Trump. Lowell referred inquiries to the White House and National Security Council about whether Kushner communicated classified information through WhatsApp, something that Cummings said would constitute a "major security breach." "For example during a meeting with Mr. Kushner's attorney, Abbe Lowell, Mr. Lowell confirmed that Mr. Kushner has been using the messaging application WhatsApp as part of his official White House duties to communicate with foreign leaders. Mr. Lowell could not answer whether Mr. Kushner's communications included classified information," Cummings wrote. According to Cummings, when pressed how Kushner was backing up his communications in order to assure that he wasn't violating the Presidential Records Act, Lowell responded that Kushner took "screenshots" and forwarded them to his official White House email account or to the National Security Council. According to Cummings, when Lowell was asked if Kushner ever communicated classified information on WhatsApp, Lowell responded, "That's above my paygrade." The fact that Jared Kushner, who couldn’t get a security clearance (or even his job) without nepotism, uses WhatsApp *clandestinely* and *illegally* to communicate with foreign officials outside official channels is another sign of his dangerous lack of fitness for public office.